Preheat the oven to 250 degrees F and line baking sheet with parchment paper. In a small bowl, mix together olive oil, garlic, parsley, thyme and lemon juice for your marinade. Brush the olive oil mixture all over the salmon and sprinkle a pinch of salt and pepper over top. 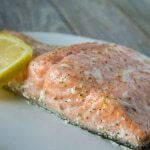 Bake salmon for 20-25 minutes or until salmon is slightly opaque in the middle and flakes easily. Optional: serve with lemon slice and squeeze a little extra lemon juice over top. If I’m pressed for time, I also use Wegmans’ Basting Oil & lemon for my salmon marinade. If you have a Wegmans near you – find this stuff. I use it on all my veggies and fish.